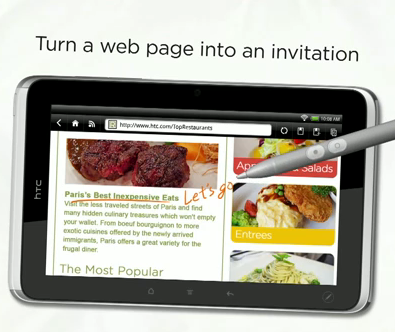 HTC Flyer, also known as the HTC View 4G in the U.S. on Sprint, is one of the more interesting Android tablets coming out within the next few months, due to its superfast 1.5GHz processor, a perfect for many (as the Nook Color and Galaxy Tab showed) 7" size, palm rejection technology, and the Scribe digital pen. Sure, we got a few hands-on here and there, but nobody can be as good as HTC itself at highlighting the best features of the tablet, at least until we get our own review units. In this 6-minute video that surfaced a few hours ago, HTC showcases the tablet's aluminum unibody construction, sleek looks, the new Sense for tablets with improved homescreen swiping, gaming, video playback, and the Scribe pen. And a whole lot more Scribe pen, and then some. Did I mention the Scribe pen?